Eagle 500, Kenrich Amplifier 20LF6 x 7 Tubes, two driving 5. As you can see it's in. 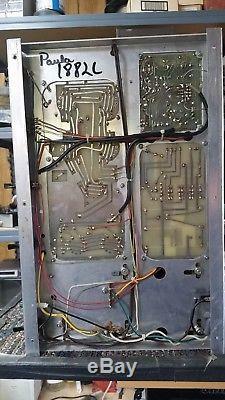 And working order, you'll be very pleased with this Amplifier. The tubes are NOS Kenrich's and the amp was recapped with new electrolytics. 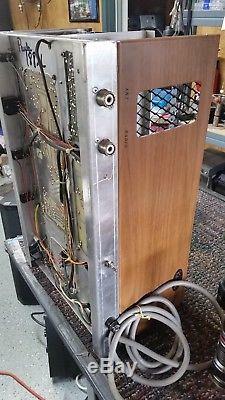 This amplifier came to me in trade and was fully functional. Since I rebuild and restore electronics I decided to upgrade the electrolytics with new capacitors (still had the originals), the New Old Stock Kenrich 20LF6 tubes (also taken in trade) were installed by me. The previous owner is now a ham radio operator so he traded this to me for ham radio related items and gear. 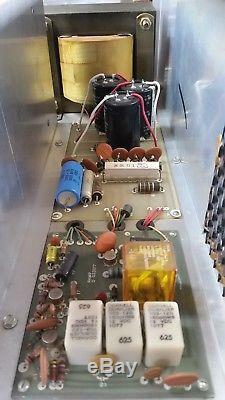 The amp had original electrolytic capacitors and old or original tubes. Given the fact that this amp is in remarkable condition along with the refresh of caps and tubes it is well worth what I have dropped the price to. The tubes will remain in the amp cabinet (not in their sockets) and placed where they cannot move around or cause damage to the amplifier or to the tube itself. Please do not contact me with questions already addressed in this listing, your message will go unanswered. Amplifier is for HAM RADIO USE ONLY!! Please follow the Laws of the FCC. The item "KENRICH EAGLE 500 AMPLIFIER REMARKABLE CONDITION NEW CAPS & NOS TUBES" is in sale since Monday, January 08, 2018. This item is in the category "Consumer Electronics\Radio Communication\Ham, Amateur Radio\Ham Radio Amplifiers". The seller is "ef-productions" and is located in Wagoner, Oklahoma. This item can be shipped to United States, Canada, United Kingdom, Denmark, Romania, Slovakia, Bulgaria, Czech republic, Finland, Hungary, Latvia, Lithuania, Malta, Estonia, Australia, Greece, Portugal, Cyprus, Slovenia, Japan, China, Sweden, South Korea, Indonesia, Taiwan, Belgium, France, Hong Kong, Ireland, Netherlands, Poland, Spain, Italy, Germany, Austria, Israel, New Zealand, Singapore, Switzerland, Norway, Saudi arabia, Ukraine, United arab emirates, Qatar, Kuwait, Bahrain, Croatia, Malaysia.